Financial Relief Experts has launched a new website with information and services to help consumers reduce debt. Bankruptcy isn't always the best choice, many clients find that through debt negotiation and settlement they become debt free within 12-36 months, some reapply their non-secured debt savings to secured debts such as mortgages and auto payments. For a long time our economy has depended on the consumer, encouraging ever increasing personal debt. Now, many individuals and families have suddenly found themselves in financial trouble through little or no fault of their own, in the current economic downturn. Financial Relief Experts understands that financial hardships are often brought on by sources outside of client's control such as: medical problems, loss of employment, business failures, credit lines drying up and more. The new Financial Relief Experts website speaks directly to the consumer, explaining the different debt reduction choices available in easy to understand terms. The new site loads fast, is easy to navigate and contains a wealth of information from authoritive sources. As a free service to visitors they also provide a large selection of dynamic continually updated personal financial news pages covering a wide range of timely topics such as; auto loans, banking news, consumer credit, employment, mortgage loans, retirement and taxes. Many website visitors have found the financial news pages to be a good "one-stop" source for personal finance news. We are living in times of more financial distress than most of us have ever witnessed. Worldwide, governments are struggling to shore up their country's over-leveraged financial institutions, banks are failing, stock markets are unstable, and companies are reducing their workforce in large numbers. Personal capital reserves have diminished and even disappeared with the mortgage, credit and stock market meltdowns. Financial Relief Experts believes that the U.S. economy will recover much quicker when "the consumer" becomes unshackled from overbearing personal debt burden brought on by deceptive lending practices, ever expanding medical bills and accelerating job losses. Banks and other unsecured debt holders are scrambling to recover any value they can from unsecured loans and are often willing to work through debt negotiation and settlement, especially when approached by professional debt arbitrators. For the most part unsecured debt can be negotiated down and many times it can be reduced by as much 60% by professionals. Underwater Debts remaining after mortgage foreclosure or vehicle repossession may also be eligible for reduction through the debt negotiation and settlement process. Many individuals and families with homes being foreclosed and autos repossessed do not realize that those remaining underwater debts may also be settled for much less than owed in many cases. Simon Webster, Financial Relief Experts Founder believes; "This economic meltdown is the worst since the Bank Panic of 1907, 100 years ago and the Great Depression 80 years ago, and it will take some time to recover. The consumer will have to reduce personal debt before a meaningful recovery can get underway. 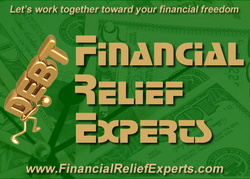 Debt Negotiation & Settlement has become the top method for many consumers to find debt relief." Its no secret that financial institutions including leading financial news agencies are projecting expanding commercial and residential real-estate defaults and increasing credit card delinquencies as the job market continues to deteriorate. Already those agencies are predicting a deepening recession while reporting that the TARP Bank Stress Tests have been made obsolete by the unemployment rate surpassing the worst case banking scenarios imagined and programmed into those tests. It appears that a new round of Bank Stress Tests will be have to be run at a higher worst case unemployment scenario. With these facts in mind Simon says that he believes; "This may be the best time consumers burdened with unsecured debt will ever see to find the road to financial freedom." He also noted that he believes that due to the extent of the financial meltdown there may be more credit forgiveness for consumers who resolve debt through the debt negotiation and settlement process as opposed to bankruptcy. Ending our interview Simon also noted that; "Bankruptcy isn't always the best choice, many clients find that through debt negotiation and settlement they become debt free within 12-36 months, some reapply their non-secured debt savings to secured debts such as mortgages and auto payments." Whether you are in need of Professional Debt Settlement Services or just want to browse timely news and tips on personal finances, there is something for everyone at the new Financial Relief Experts website.